Early in the season is a tough time to make heads or tails of the NCAA hockey teams. So little has been seen or so few stats accumulated it is hard to make patterns out. That being said, UMD faces a tough opponent in Notre Dame and being on the road is not not new to this Bulldog team, but will give them an added challenge. Look for early season indicators if UMD is ready for the high praise they are receiving from national polls and wonks. Picks by @afiskness. UMD fans are happy to see that the Taconite Trophy will remain in Duluth! Last weeks performance for the Bulldogs was exactly what the team needed. The Bulldogs dominated the Gophers from the Twin Cities and hope to use this momentum on their trip this weekend to South Bend. Minnesota Duluth @ Notre Dame: Last weekend the Bulldogs showed why they were #2 team in the preseason poll with a pair of dominating wins against the Gophers. The Compton Family Ice Center is always a tough place to play, but I think the larger than standard North American rink size will play to the Bulldogs advantage. I will pick a UMD sweep. Western Michigan @ Clarkson: The Broncos are heading to Potsdam, New York to take on Clarkson from ECAC. I know that the Broncos will look to slow the game down as that is what they do, but I don't know what to expect from the Golden Knights. The Golden Knights last weekend were crushed by the Warriors of Merrimack but followed that up with a nice win against the Wildcats of New Hampshire. Because it is a road series for the Broncos I will go with a split. Miami @ St. Lawrence: This is a great match up of two ranked teams from the NCHC and ECAC. The Redhawks are coming off a sweep of the win less Ohio State and St. Lawrence a win and loss last weekend against Hockey East opponents. This will be a tough trip to Canton, New York for the Redhawks. I will go with a split. St. Cloud State @ Quinnipiac: This should be another a very good series for NCHC versus ECAC teams. Charlie Lindgren and the Huskies are on fire, but the Bobcats are not a slouch. The home ice for the Bobcats at the High Point Solutions Arena should help them earn a tough played split. 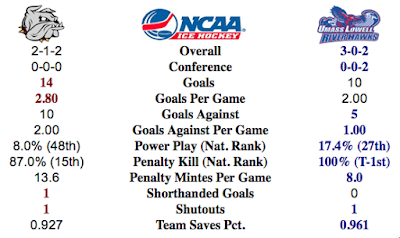 North Dakota @ Vermont: Last weekend the Catamounts were swept by the Mavericks of Omaha and now they face North Dakota. I don't think the home ice will be enough for the Catamounts as North Dakota will sweep. Air Force @ Nebraska Omaha: The Falcons have upset one NCHC foe already this year, but the Mavericks are red hot and they are my pick as the top team in the country. Mavericks sweep. Boston College @ Colorado College: The Eagles will have little difficulty dispatching the Tigers this weekend in a sweep.